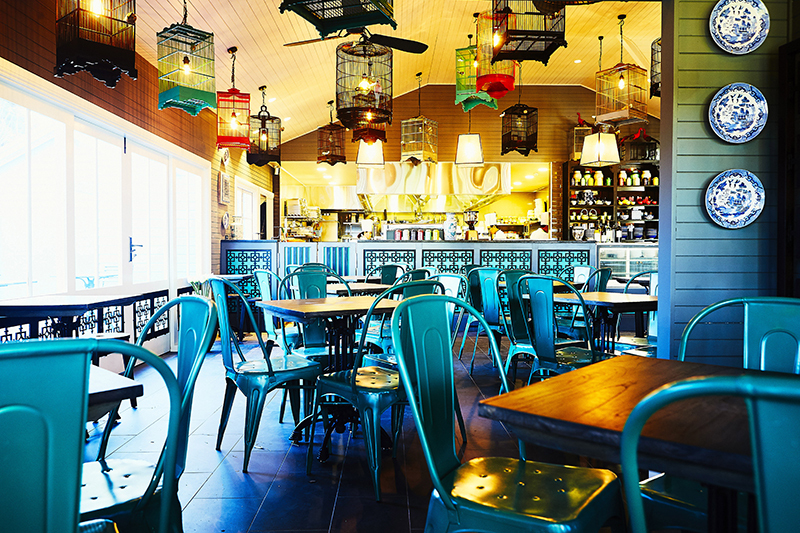 Birds of a feather … Miss Lilian Tea House in Katoomba has diners flocking for tables. Asian street food with style in the Blue Mountains. It’s hard to pigeonhole Miss Lilian Tea House in Katoomba, even with the myriad birdcages and feathered taxidermy hanging from the ceiling. It’s Asian street food but with a more sophisticated edge – in the menu, service and decor – and that makes it a one-of-a-kind restaurant in the Blue Mountains. It’s nice to be able to dine somewhere that glows with rich light and colour; that buzzes with diners chinking glasses and slurping noodle soups and where the waiters attentively top-up your water. It crosses that better-than-casual-but-not-too-formal divide. The food is top-notch Asian, from Malaysian ramen to Vietnamese pho to Thai curries, laksa and – hail the Three Sisters – dumplings! More please … Coconut prawn pate skewers. Our table of six hungry diners orders entrees from across the continent – the pork bao mi folded buns (two for $16) are fluffy and filling; the prawn and chives dumplings are just how we like – flavourful and juicy (chef’s selection $15 for five) and the sugarcane skewers of fried coconut prawn paté ($18) are so unmissable we order another round. To share or not to share? … Thai green curry. Dinner is designed to be a shared affair but anything goes as well. Some in our group band together and divvy up the Thai green curry with chicken, pumpkin, eggplant and beans ($28) and a wagyu beef pho noodle soup ($25); while others go it alone with a vegetarian tofu-and-sprouts laksa ($22) and a Tasmanian king prawn and papaya salad ($28). (The salad-eater concedes carb defeat and tops-up with an extra plate of dumplings). Generous sprinklings of fresh herbs – coriander, lemongrass, mint, chilli – on everything makes it all wonderfully fragrant and tasty. 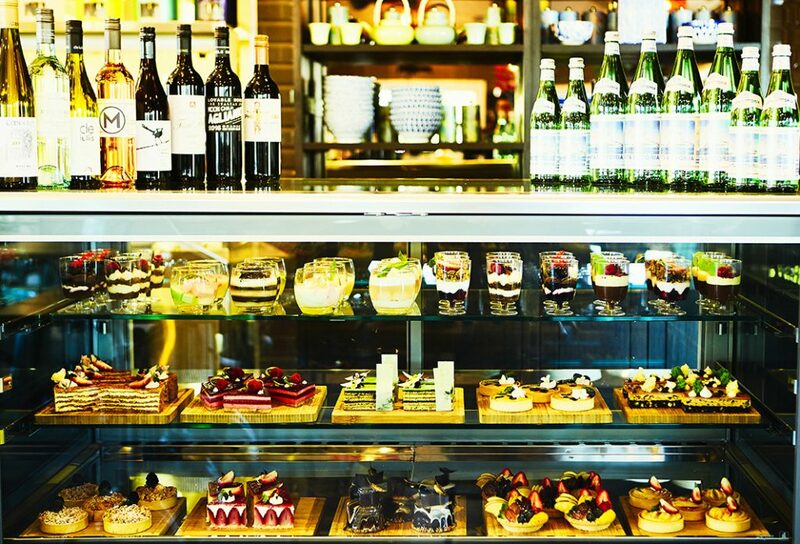 Spectacle of sweets … the dessert bar at Miss Lilian Tea House. But there’s more. One can’t walk into Miss Lilian Tea House and not immediately notice the spectacle that is the dessert fridge – strategically placed at the entrance so you’ve already made a mental note of what will finish your meal before it’s even begun. Pretty, colourful slices and slivers appear on our table, dusted with biscuity crumbs, berries and flower petals. It’s a feast for the eyes and our appetites do not protest, especially not the iridescent green tira matcha – a tira misu made with matcha green tea (all desserts $16). Matcha made in heaven … Tira Matcha dessert with blossom tea. Wine, spirits and cocktails are available, but tea, being this restaurant’s namesake, is where it’s at (at least after dinner, that is). There’s your usual suspects but the one to order is the blossom tea ($8) which comes in a fancy pot to showcase a blooming flower of strawberry, jasmine or lavender amongst other flavours. Afterwards, if it’s a nice evening, the stroll to the Three Sisters at Echo Point – which are lit up spectacularly at night – is just about as inspiring* as the dessert fridge that started off this whole epicurean adventure. * Probably a bit more inspiring… you be the judge. ** Note: All images supplied by Miss Lilian Tea House as I had a camera malfunction on the night!